Hello everyone! A slightly different post from me today. A knitting project. I don't know if I ever mentioned this here before, but I do know how to knit. And I actually enjoy knitting. It's the perfect activity to do when watching a series or a movie, and I love how you can do it without actually moving from your couch. 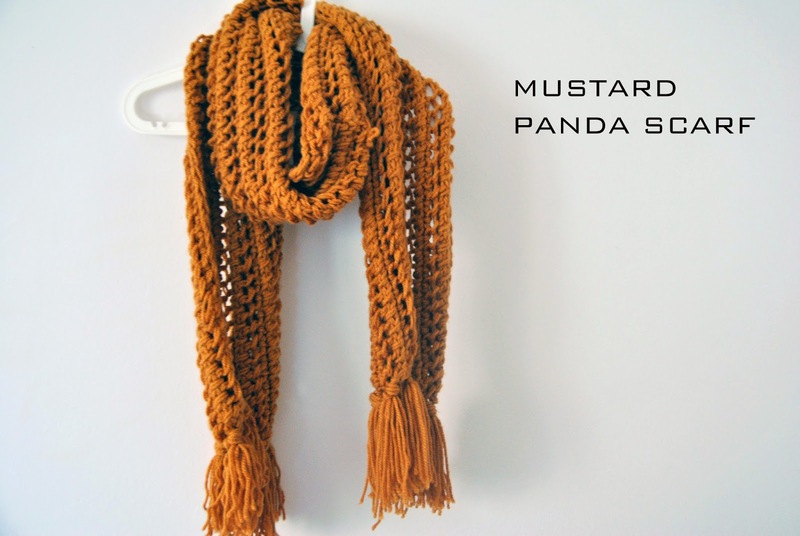 I wanted a mustard colored scarf for a long time, but I couldn't find one I liked. When I saw this mustard yarn I knew I had to make one. 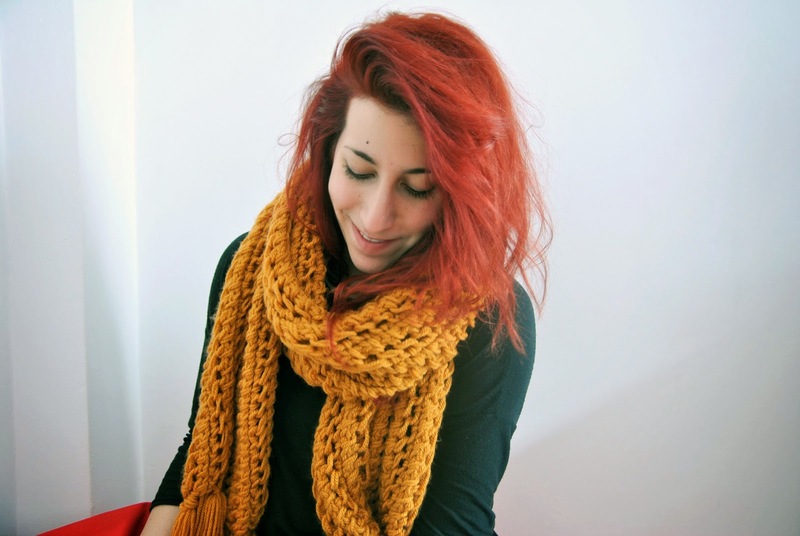 As always I browsed through Ravelry for some inspiration and ideas and I found the Panda Scarf, a free knitting pattern. It was perfect for what I had in mind. I used a pair of 10mm(US 15) needles and this bulky(12 ply) yarn. 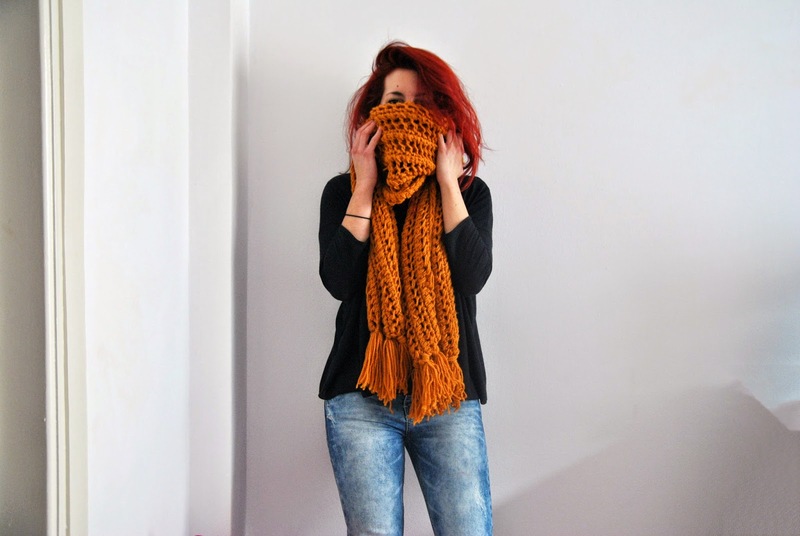 I love the finished scarf and I've already worn it tons of times! So what do you think? Do you knit? What are you currently knitting? I love this scarf! I just learned how to knit a couple weeks ago, and I'm really enjoying it. It's definitely nice to have a hobby I can do on the couch on days when I don't want to venture upstairs to my cold sewing room! Your scarf looks really cool! Great colour! I like that it's chunky but the lace stitches make it look light. I might ad this to my Raverly library! I love knitting, I'm currently knitting Frostlight (also a scarf) free on Raverly, but i've inserted a 12-stitch cable in the center, just for fun. This looks great!!! I am really into knitting right now- I started knitting before I knew how to sew, but haven't done much of it lately until this winter. I am working on the Ondawa sweater by Michele Wang... it's really, really fun to knit!